The most fascinating, unbiased and authoritative source of information about what’s happening in the newspaper industry is provided by the Pew Research Center, Journalism and Media. Its annual State of the News Media report is essential reading. Newspaper associations include WAN-IFRA — World Association of Newspapers and News Publishers, the U.S. News Media Alliance, NMA (formerly known as the Newspaper Association of America), the News Media Association in the U.K., and News Media Canada. As is the case in other industries, these associations guard most of their data for members only. Latest U.S. circulation data as calculated by Pew. Peak year was 1993. 2016 number is some 60% of that. The link also provides insight into digital circulation data as well as advertising and circulation revenue (29% comes from digital as of 2016). A range of U.K. newspaper industry data here and here. Latest Canadian daily newspaper circulation numbers here. The in-depth Reuters Digital News Project “marks an expansion of the Digital News Report into a full‐scale series of research pieces”. pwc’s Perspectives from the Global Entertainment and Media Outlook 2017–2021 (pdf) is well worth a look. The newspaper industry leads the charge to provide compelling proof that the Internet really is destroying traditional ink-on-paper publishing. The data has been troubling for a long time, and gets more convincing each day. 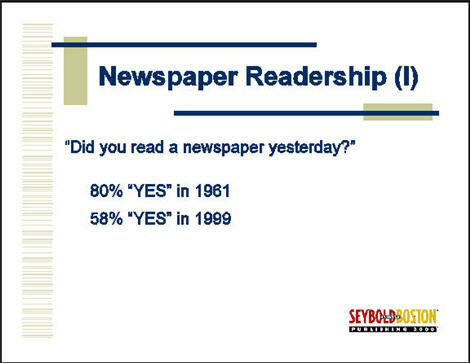 A lot of analyses gloss over the data which demonstrates that the decline in newspaper readership and circulation easily predates the Internet. The story of the decline of the daily newspaper goes beyond the web. Furthermore the U.S. trends are not fully mirrored worldwide ‒ is that because of lagging indicators or fundamentally different forces at work? The enduring strength of newspapers is their local coverage, from community news to financial to entertainment. The reality is that city newspapers have more “feet on the ground” than any of the competing city web sites. The smartest newspaper managers are translating their community strength onto the web. Community newspapers and other weekly newspapers seem to be largely avoiding the fate of their daily brethren. My overall rating for the future of the traditional newspaper industry, first in North America, and spreading rapidly to all devloped countries, is very negative. My hopes and expectations of a renaissance for the industry, just as determined. Is the picture so rosy? On the surface, newspaper publishing in North America appears to be in big trouble; but then, the newspaper industry been in ever-increasing trouble for a long time. When I first began this study around 2000, I offered this slide (based on a data source I can no longer locate ‒ sorry). Clearly this is a troubled medium. Equally clear is that the problem in newspaper circulation pre-dates the Internet by some years. Theories abound. Radio and television must surely shoulder some of the blame; just as likely is that changing lifestyles impacted newspaper readership regardless of competing media. Although a non-profit organization, it was formed by the interested parties: advertisers, ad agencies and publishers. Unfortunately also, you must be a member ‒ they’re not giving this “sensitive” information away ‒ and so it’s impossible for the public to get up-to-the-minute newspaper circulation data (one needs to pony up somewhere between $100 and $2500 for an associate membership). You can find some generic data here but not specifics. According to a September 2008 report in Media Life Magazine, “Newspapers have been struggling for years and continue to. As with other periodicals where advertising is a substantial source of revenue, there is constant conflict between newspaper circulation, readership and advertising. If circulation is not the answer to the newspaper industry’s profitability, obviously advertising is, and newspaper advertising rates have traditionally been based on total readership, rather than circulation alone. The theory has more merit in the magazine industry: that more than one person might read a copy of a particular issue. 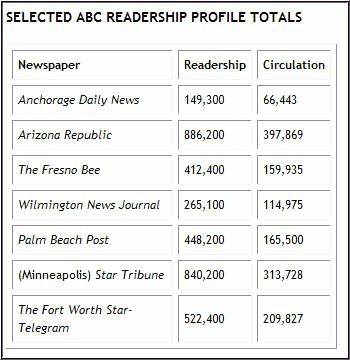 The newspaper industry found gold in the concept, and with its partner-in-numbers, ABC, began to measure total newspaper readership as an adjunct to circulation. I would argue that pass-along readership is generally overstated, and often offset by “incomplete readership” – the many who find time to look at only a portion of the newspaper, missing perhaps the bulk of the ads (or having no time to absorb the advertising message). 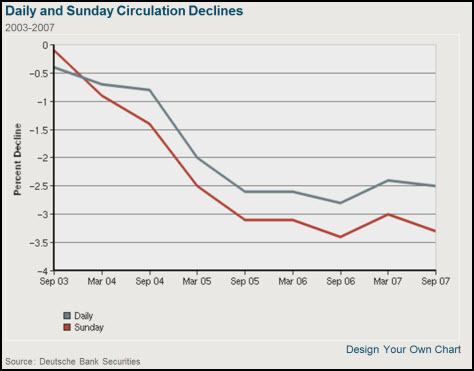 When it comes to the newspaper industry, circulation is the more reliable figure. Hence newspaper ad rates are increasingly focused on the latter figure, rather than on the very difficult to verify “total readership” number, particularly as the Internet makes the practice of audience measurement and response more of a science than a black art. There’s no question in my mind that the single most authoritative report on the state of journalism is The State of the News Media 2008, published last March by the Project for Excellence in Journalism, a non-political, nonpartisan research institute that is part of the Pew Research Center in Washington. (The report is available here in sections, with excellent interactive features. The full report is comprehensive, totalling more than 160,000 words.) It covers most key media: newspapers, television, radio, magazines and online journalism. It also identifies trends, marks key indicators and notes areas for further inquiry. The easiest way to access the full findings is via the Introduction. It is relatively brief, and certainly incisive. Here are just a few of the conclusions from the 2007 edition concerning the publishing industry here (in a different sequence than they appear in the report). I’ll leave it to you to peruse the 2008 summary, although the previous reports remain online. This suggestion of course remains anathema to many publishers and most Web users. All of the newspaper trends we’ve been recently witnessing point to advertising footing the bill, not users, per se. The New York Times recently abandoned revenue from over 200,000 paid subscribers in favor of an ad-only model (there were nearly 750,000 total users, but about two-thirds gained access as part of a print subscription). Advertising is still a largely workable model for many publishing media. It is suffering, but far from dead. Are we certain that advertising alone can actually continue to fund the enormous content treasures which lie on the Web? I think this is probably the most startling observation in the entire report. The notion that journalism, per se, as we’ve known it, is losing import as a direct result of the media transition to the Internet is a radical proposition. As shocking as this may be to hundreds of thousands of journalists and the support personnel that make journalism available and accessible, the evidence is compelling. 3. “While journalists are becoming more serious about the Web, no clear models of how to do journalism online really exist yet, and some qualities are still only marginally explored.” Another trenchant observation. Is the failure of journalism’s transition to the Web more a factor of point #2 above, that journalism as it has been known, on television and in print, no longer compels, or more that journalists have not learned how to make online journalism compelling in this new medium? A fascinating and important article from The New York Times (“Why Big Newspapers Applaud Some Declines in Circulation,” October 1, 2007) puts an entirely different spin on the problems facing the future of newspapers. The lead to the article states its argument clearly: “As the newspaper industry bemoans falling circulation, major papers around the country have a surprising attitude toward a lot of potential readers: Don’t bother.” The article’s author, Richard Pérez-Peña, continues, “The big American newspapers sell about 10 percent fewer copies than they did in 2000, and while the migration of readers to the Web is usually blamed for that decline, much of it has been intentional (emphasis mine). Driven by marketing and delivery costs and pressure from advertisers, many papers have decided certain readers are not worth the expense involved in finding, serving and keeping them. Pérez-Peña points to a trend consistent with advertising in all media: certain customers are worth reaching. But big numbers, by themselves, no longer impress. The Internet has magnified a publishing trend that probably first flowered with controlled circulation magazines: identify the customer, and deliver the right ad to the right customer at the right time in the appropriate medium. The newspaper industry has struggled as hard as most publishing industries to find the right way to balance their traditional print product with an appropriately complementary and compelling online presence. They’ve struggled even harder to figure out how to make money from online efforts. Optimists increasingly feel that the newspapers companies are finally starting to “get it” when it comes to the Web, and that they’re not too late to the party. Pessimists (realists?) worry whether the very rapid decline in newspaper circulation and ad revenue can be offset sufficiently through successful Web programs. This article must read as if the news is all bad for the newspaper industry. That is not the case. There are three relatively bright spots on an otherwise gloomy horizon: free dailies, community newspapers, and looking outward toward the global newspaper industry. I’ll cover these in order. “For instance, in the U.S., the circulation of paid-for papers dropped 4 percent from 2001 to 2005, hitting 53.3 million. It also dropped 2.3 percent in 2005 compared to the year earlier. “But that was nearly made up for by the growth of free papers, whose circulation grew by 127.9 percent over the five years, to 3.3 million copies. By 2005 free papers accounted for 5.8 percent of the U.S. newspaper market by circulation, up from 2.5 percent, according to WAN. The number of free titles grew to 34 from 19 over the period. “Free papers saw similar growth in Europe. By 2005, free papers had grown to make up 15.3 percent of all daily newspaper circulation, up from 7.6 percent, having grown 104 percent over the period, to 16.4 million. There are now 87 free daily newspapers in Europe. Not surprisingly the news is not all rosy, particularly in the current economic downturn. 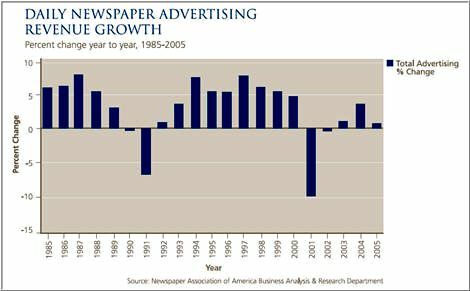 A blog entry by Roy Greenslade at the UK’s Guardian newspaper called “Free newspapers feel the pinch as advertising slump takes hold,” asks if we are beginning to witness the bursting of the free newspaper bubble? If you’re interested in pursuing this subject further, the site to visit is Newspaper Innovation: Daily Blogging on Free Newspapers. It’s excellent. In the U.S. they’re often referred to as “Suburban Newspapers,” in Canada they’re called “Community Newspapers,” but either way these are the weekly papers that are published weekly in smaller communities. It’s a little confusing given that most large cities in North America also have one or two free weeklies, that fill a similar but not identical roll as the small community weeklies. The latest data I can find on these papers paints a much healthier picture for circulation and ad sales than we find with the dailies. 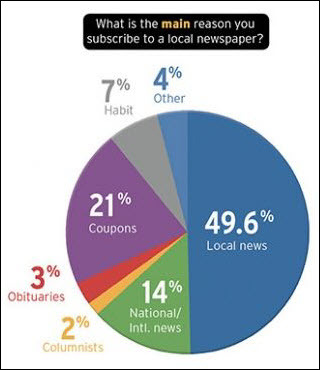 In June of this year the Suburban Newspapers of America (SNA) reported that “Suburban and community newspaper executives report optimism and growth. This is the finding of a beta report that included financial and other data from many of the largest members of the trade association Suburban Newspapers of America. The beta companies represent total circulation of 12.5 million and approximately $2 billion in annual advertising revenue. These newspapers provide much needed hyper-local news and information – typically not found anywhere else – to the communities that they serve. 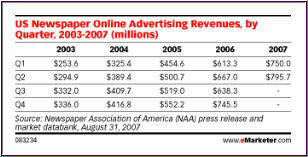 “The beta results showed that 2007 was a growth year for the community newspaper industry with advertising revenue up .5%, as compared to the overall industry decline of 7.9% reported by the Newspaper Association of America. 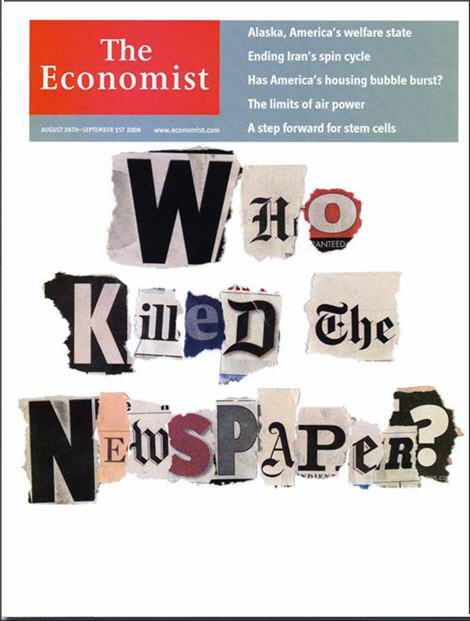 In the midst of this gloom, the February 15,2007 issue of The Economist reported that in India there are some 300 big newspapers, and they experienced a 12.9% increase in circulation that year. Indian government figures shows growth of newspaper and periodical titles at nearly 50% from 2001 to 2010. The publications are in 16 different languages, with Hindi the number one language and English number two. Newspaper competition is fierce, and the profits are substantial. A 2016 update is found here. The global newspaper industry is continuing to grow because of emerging economies like those of India and China, even while the future of the newspaper industry is seriously threatened in the mature (largely Western) countries. The best source for data on world newspaper trends is the World Association of Newspapers and News Publishers which groups “76 national newspaper associations, individual newspaper executives in 102 nations, 10 news agencies, and 10 regional press organisations. It is a non-profit, non-government organisation. In all, the Association represents more than 18,000 publications on five continents.” The PDF executive summary of its “World Digital Media Trends 2008” provides lots of data showing that simply focusing on the North American newspaper market is not indicative of the state of newspaper publishing around the world. There appears to be very little doubt that newspapers in the United States are facing the greatest threat in their history. The numbers grow more grim with each new report. Does the United States truly represent the future of the newspaper industry, or might the specific conditions here be anomalous? I believe they do actually represent the shape of things to come, hence my very negative rating at the start of this article. But the story is far from over. It’s a fascinating ride. And the always-excellent Canadian Ryerson Review of Journalism. 8. Bob Sacks, aka BoSacks, a learned veteran of the American media industry, has a very good website, although if you can digest three entries per day, you can subscribe to his essential industry newsletter. Russell Baker is a veteran of this war and those that have preceded it. His fascinating article in the New York Review of Books is well worth the read.